I'm looking at buying a few new Perc libraries this month and one in particular that I've been pondering for a while is Cinesample Cineperc. It seems like a large collection of different percussion and a few people have said to me that it's a flexible library with the different mic positions. I own Strikeforce and HZ Perc (to name a couple) and I'm thinking this could be a perfect accompaniment to my collection as looking at the instrument list it goes from Orchestral Perc to Big cinematic stuff which would be very handy for some of the film and tv stuff I'm doing. The library has been out for quite a few years now. With so much competition out there, is it still a good purchase? Is it flexible? I'm kind of avoiding any libraries that have a unique sound, for example, Damage, as that kind of thing is quite easy to identify in so many people's music. stprodigy, jononotbono and richardt4520 like this. I can get 50% off as a student. Thanks man, I will buy it in the next couple of weeks then! Major score! Go for it!!! 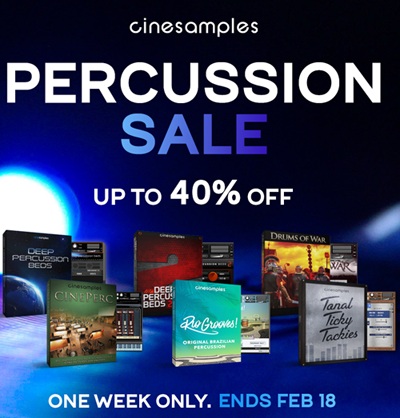 I still think CinePerc is one of the best recorded percussion library available, Dennis Sands did a great job. No matter how old, a good recorded library (especially percussion) will always sound good (like EWQLSO). stprodigy, Mike Fox, richardt4520 and 1 other person like this. stprodigy, Mike Fox and richardt4520 like this. It's a very good library, and I agree with maxime77 that there's nothing to say "old" libraries are no longer any good - in fact there are some Giga ones that are still great (Larry Seyer bass, his drums, Cool Vibes, and the Notre Dame de Budapest organ, for just a few examples). But I'm not sure I'd call it orchestral percussion, because it doesn't have the standard orchestral instruments - snare, BD, timps, chimes, glock, xylophone, cymbals, etc. It actually does Nick - the CORE version contains all of the standard orchestral percussion instruments you'd use in a typical orchestral cue. stprodigy, Nick Batzdorf, richardt4520 and 1 other person like this. stprodigy, jononotbono, richardt4520 and 1 other person like this. Yes, a well recorded library will always sound good. This is true. However, older libraries often don’t have what we have now. For example, many round robins, dynamic layers and better scripting. That’s what I’m referring to when’s i use the word “old”. Not the actual recordings of the samples. I’ll be buying this very soon. Cine Perc has has 4 libraries combined and Orchestral perc is included. It’s why the price is higher than many Perc libraries. Just by the sheer selection of different instruments. This is actually going to be my next perc buy. The Spitfire Thunderbolt sale almost had me with their percussion library being part of it... but I think I'll save my pennies for CinePerc. CinePerc will never get dated. If it's good, it's good, and it is. I will say that I do like some of the melodic perc from SA's Redux a bit more than Cineperc, but Cineperc's snares, cymbals, timpani, etc, are just so damn satisfying. Yeah Spitfire almost had me with the Burgess percussion but I'm just going to wait for the next big Cinesamples sale and go for it. I have Berlin Percussion and a handful of epic stuff. I feel like Cineperc will fill in a bunch of stuff and also compensate for some of the stuff Berlin isn't so great about (noise issues on a lot of the tonal stuff). Cinesamples' BEST library for sure. On their next BIG sale I just might pick up ALL of Cineperc.